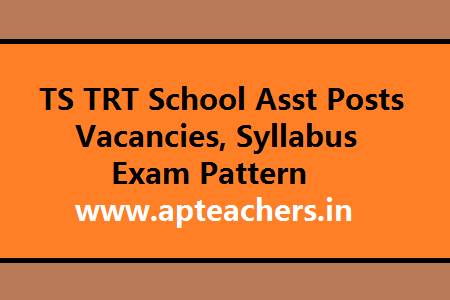 TS TRT School Asst Posts Vacancies, Syllabus Exam Pattern, Qualifications, Eligibility Details NOTIFICATION NO. 52/2017 D t . 21 /1 0/2 0 1 7 TEACHER RECRUITMENT TEST IN SCHOOL EDUCATION DEPARTMENT SCHOOL ASSISTANT. School Assistant – All media (Excluding Urdu medium). The Details of Vacancies department wise i.e., District, Community, Subject, Medium and Gender wise (General / Women) may be seen. Mathematics, Physical Science, Social Studies, Bioloy, Telugu, Hindi, English Posts TS TRT Notification Post Wise, Roster Wise, Community Wise Vacancies. School Asst Posts Syllabus for TS TRT 2017, School Assistant Posts Exam Pattern for TS TRT 2017. TS TRT School Asst Posts Vacancies, Syllabus Exam Pattern. School Assistant – All media (Excluding Urdu medium). The Details of Vacancies department wise i.e., District, Community, Subject, Medium and Gender wise (General / Women) may be seen. Mathematics, Physical Science, Social Studies, Bioloy, Telugu, Hindi, English Posts TS TRT Notification Post Wise, Roster Wise, Community Wise Vacancies. School Asst Posts Syllabus for TS TRT 2017, School Assistant Posts Exam Pattern for TS TRT 2017 in PDF File Download Below. Thanks for the syllabus update. I really wish that I had such syllabus details about Bihar Police Constable Exam whose result is just about to be announced at www.csbc.bih.nic result 2017 website.